Description of "Ek Aur... Geetanjali"
Poetry serves as inspiration. Gurudev Rabindra Nath Tagore's Gitanjali has been translated several times in many languages. 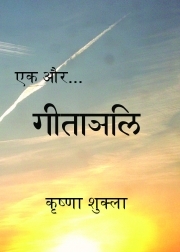 Ek Aur... Geetanjali comes out of author's memory of the poem read over a period of five decades. Krishna Shukla, a brilliant academic performer devoted her life to bringing up her family before picking up her pen again in seventies. Reviews of "Ek Aur... Geetanjali"